Jane Heathcote, Margaret Heathcote, and Tiffany Gair are representatives on the All-State Orchestra. Jane Heathcote, Margaret Heathcote, and Tiffany Gair had the honor of performing at the University of the Pacific in Stockton, California on November 27, 2018. 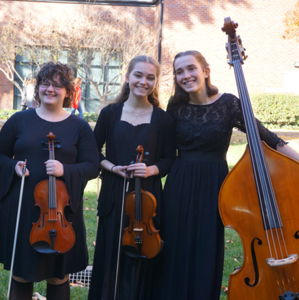 Each of these students were selected to the All-State Orchestra. Jane Heathcote performed as a member of the California All-State Honors Symphony Orchestra. The Honors Symphony Orchestra is the top tiered orchestra at the state level. Jane also was chosen to be the Section Leader (First Chair) for the bass strings. She is considered to be the top high school bass strings player in California. Margaret Heathcote and Tiffany Gair were selected to the California All-State Honors Strings Orchestra. Margaret plays the violin, and Tiffany plays the viola. RMCHS is very proud of the accomplishments of these musicians.